Insurers that embrace the convergence between cybersecurity and insurance will strengthen their hold on the market. Boston, June 22, 2016 – Although the insurance industry has been selling cyber insurance in the United States, and to some extent internationally, for a number of years, the market is still in its infancy. Cyber insurance still represents less than 1% of global commercial insurance premiums. 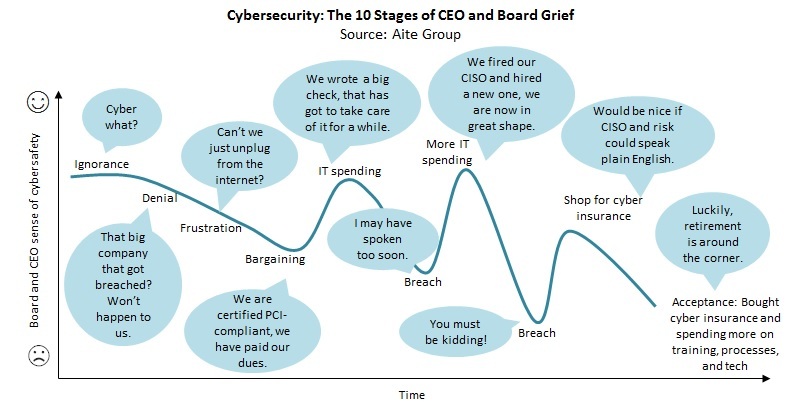 Demand is growing, though, as more firms go through the 10 stages of cybersecurity grief. But as risks mutate, insurers are pursuing two objectives. First, they want to shield themselves from the silent cyber exposures buried across all of their products. Second, they want to grow their market share in this emerging segment of the commercial insurance universe. Cyber risks are a complex problem, and insurers (along with brokers and reinsurers) are keenly aware they won’t succeed by going it alone. They badly need help. And a host of vendors is responding to the call to arms. This report first highlights a few trends shaping the cyber insurance market and profiles 35 vendors that are catering to cyber insurers, brokers, and reinsurers: Advisen, AIR Worldwide, AllClear ID, Axio Global, BAE Systems, BitSight, CGI, CrowdStrike, Dynetics, Epiq Systems, Experian, FireEye, FourV, IBM, ID Experts, IDT911, K2 Intelligence, Kivu Consulting, Lockheed Martin, Morphick, PivotPoint RA, QuadMetrics, Radar, Risk Based Security, RiskAnalytics, RiskGenius, RMS, RSM, SecureWorks, SecurityScorecard, Symantec, The Crypsis Group, UpGuard, Verisk’s ISO, and Zeguro. It is based on over 60 Aite Group interviews conducted between January and June 2016 with cybersecurity vendors, insurers, brokers, actuarial consultants, attorneys, and insureds’ risk managers and information security officers. This 81-page Impact Report contains eight figures and one table. Clients of Aite Group’s P&C Insurance service can download this report.